Have you ever used Borax for your crafts? I've used it for years to make better bubble solution. 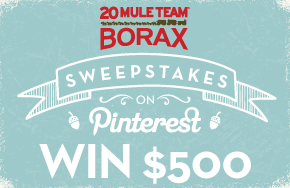 Would you like to share about your Borax crafts and be entered to win $500? Just enter here and share how Borax helps make your house even more beautiful. Get crafty with 20 Team Mule Borax. There are so many ways 20 Mule Team® Borax can help beautify your home, learn how to get crafty and get entered to WIN $500! Disclosure: I am a Purex Insider and am entered to win a prize for sharing with you.